A few months ago I though lambing would be easy. Emotional in an "Oooh! Babies!" sort of way. I pictured a ewe giving birth in the barn. She would clean and rouse her babies and we'd find them early in the morning, strong and healthy, nursing contentedly in the straw. It hasn't worked out that way over here. Okay, it has. But not every time. I guess thought it would look like that every time. But the truth is, we've lost lambs. And it aches my heart. But yesterday we also found a bit of balance. And we stood together, watching and in awe as this baby was born. This birth was a balm for my weary heart. This was what I imagined. Welcome, Buddy. We're honored to have you here. And we're oh so glad you made it. How wonderful! Sounds like it’s just what you needed. That baby is just beautiful! I bet the down times are otherworldly. I don’t know that I could manage with the uncertainty. Farming is intense. It is really pretty hard to describe until you experience it yourself — all on your own. Really makes like feel all the more precious and fragile and miraculous. He is a handsome little fellow! Yes, farming, especially with animals, is not easy, but more often than not it sure is rewarding. So Thankful. I can see expectancy, hope, anticipation and some worry in Lupine’s little face above. I’m sure she’s thrilled! So glad that Mother Nature has allowed you this goodness. 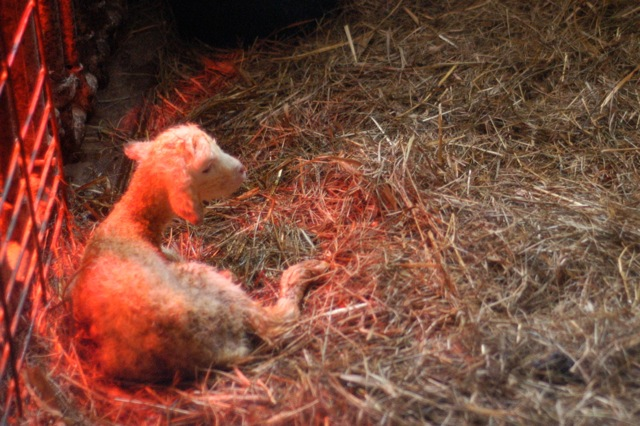 I have never seen a sheep being born – wow! What a learning experience for your children. Do the mothers let you touch the lambs? Love the stone walls in your barn – more natural beauty! What a wondrous and lucky thing to witness. I hope one day my family too can be so in touch and present with the ways of life. I’ve never commented here before, but this post made me smile. I grew up with baby goats coming every spring and this picture of Lupine reminded me of myself at her age–awestruck and thrilled. Sometimes it is hard on the heart, but oh it is such an amazing experience. Wishing you many more healthy lambs this spring! !